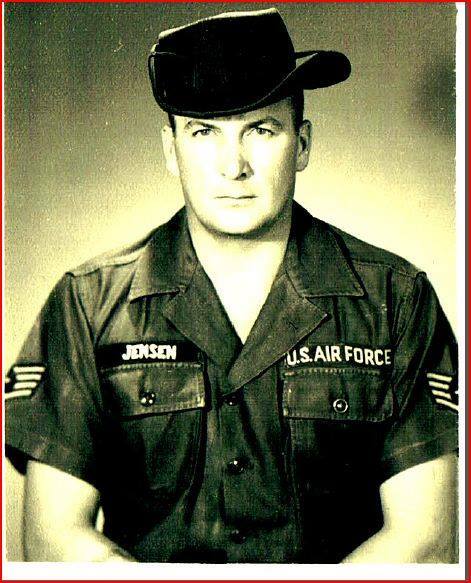 Early on the morning of July 1, 1965, thirty-three year-old Air Police SSgt Terance K. “Tony” Jensen was checking on his scattered sentries guarding the Da Nang flight line and bringing them hot coffee. Jensen, who first joined the Air Force in 1948, was an almost larger than life character. Ten years earlier, he won a Soldier’s Medal for jumping into the nearly freezing Clinton River near Mount Clemens, Michigan, and saving a girl from drowning. In San Antonio, Texas, he wrestled a mad dog with his bare hands rather than shooting it and risking hitting aircraft on the flight line. While stationed in Alaska, Jensen, an award winning pistol shot, faced down a charging seven and a half foot tall black bear and killed it with a bullet to the head. It was about 0115 hours when SSgt Jensen in his Dodge truck reached the post where A1C Albert L. Handy, just recently arrived on temporary duty from the 831st APS at George AFB, California, was standing guard. Handy opened the passenger’s door of Jensen’s truck and Jensen asked how he was doing. 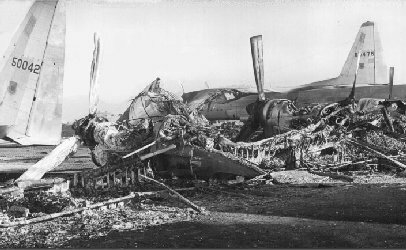 Handy reported that it was pretty quiet, got a coffee cup and was reaching for the coffee jug when the thud of a distant mortar was heard and a C-130 transport at the south end of the flightline exploded. Though Jensen and Handy did not know it, attacks had been simultaneously launched against other areas of the base perimeter. Jensen directed Handy to report the attack to the CSC on his radio. As Handy moved away from the truck to retrieve his radio, he saw silhouetted in the flames from the blazing C-130 about 15 VC in black fatigues and camouflaged helmets firing in his direction with automatic weapons. Handy began returning fire on the run. 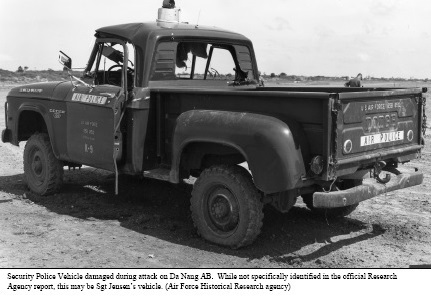 Jensen also saw the VC and tried to bail out of the truck, but the door may have stuck, and Jensen may have been first hit by enemy fire while still in the truck struggling with the door or soon after he got out. Handy, sprinting toward the radio at his post, saw Jensen take two or three steps toward the enemy before he fell. Holding the radio in one hand while firing his M-16 at the advancing VC with the other, Handy reported the enemy contact to the CSC. Meanwhile, the painfully wounded Jensen crawled to the rear of his truck and began firing his .38 revolver at the enemy. Jensen and Handy were the only things standing between the attackers and a bunker in which 25 flight line personnel had taken cover from the incoming mortar rounds. Handy was under heavy fire and heard hand grenades and mortar shells exploding all around. Under the circumstances it was perfectly understandable that his primary thought was to “head for cover” and he later reported that he “dove into his foxhole and came up firing.” Quickly emptying one clip of ammunition, Handy reloaded and opened fire on three or four VC who had taken cover behind a tent. His fire drove them from their position and they retreated toward the perimeter road. Even though automatic weapons fire was still coming at his position, Handy noticed the VC beginning to fall back. Although Handy couldn't see him, the wounded Jensen continued firing at the VC with his revolver and drew fire in return. Some accounts speculate that an enemy guerrilla finally came up behind Jensen and shot him several times in the back, killing him. The Security Alert Team (SAT), responding to the enemy penetration, pulled up about 100 yards north of where Jensen and Handy were pinned down and then drove off. When it returned and stopped about 50 yards away, Handy rolled out of his foxhole and into a drainage ditch and began running toward the truck as fast as he could, yelling out his name so he wouldn’t be a victim of friendly fire. The enemy sappers had by now pulled back, although the mortars outside the base perimeter lobbed two or three more shells into the F-102 and C-130 aircraft cantonment areas. 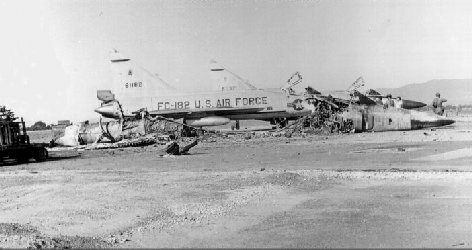 The VC left behind three destroyed C-130 transports and three destroyed F-102 fighters along with another four damaged. One attacker was captured. Total American loses were two Marines wounded and SSgt Jensen killed in action (KIA). After action reports concluded that, “Immediate resistance by Security Police [sic] on duty caused the enemy to attack prematurely and decreased the effectiveness of the enemy actions.” SSgt Jensen was posthumously awarded the Purple Heart and the Silver Star for gallantry for his actions that night on Da Nang’s flightline. He left behind a wife and four children. 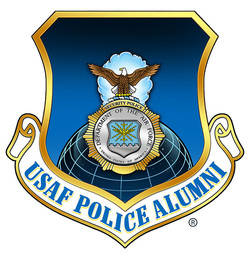 He was the first of 110 Air and Security Police who would die in South East Asia.